There is a sharp electric spark in the heart of Jersey City, 10 minutes from Downtown Manhattan: a well-equipped, sweet-sounding recording studio that embodies the best of vintage analog and modern digital audio. New Record Studios: designed from the ground up to make you sound your best! New Record Studios is a commercial recording studio with the comfortable feel of a large home recording environment. Working with us, you experience the low-key vibe of recording in a friend’s ultra-cool 1400 square-foot loft, while you reap the benefits of a working with a talented engineer in a full-on professional recording studio featuring high-end, carefully calibrated electronics, and professionally designed and acoustically compensated rooms. Come on over, let’s make some music! We offers a wide range of studio services, including: Music Pre-production and Arrangement, Live Recording, Mixing, Mastering, Commercial and Broadcast Audio Production, Voiceover Recording, and Podcast Production. We also have a stable of fantastic studio musicians — from drummers to vocalists – who can help enhance your recordings if you need more instrumentation or singers. Upon Request we can provide professional live footage of your sessions, including multiple high definition cameras, in-house editing, and postproduction services at very reasonable rates. These often form the basis or the b-role for fantastic music videos to promote your recordings. To learn more, visit Video Production. Founded in 1999, our original facilities were in a great-sounding church on the Upper East Side of Manhattan. When it came time to relocate, we searched two years for the perfect spot – and we found it! New Record Studios is now located to the heart of downtown Jersey City, in a location that embodies the vibrancy and promise of the artists we work with and support – the Powerhouse Arts District! Our client list at New Record Studios includes quite a few names you will recognize. Join them in letting us help you make fantastic recordings of your own beautiful music! Stefani Germanotta (Lady Gaga), Jessie J, Sheryl Crow, Norah Jones, Esperanza Spaulding, Billy J. Kramer, Rashied Ali (Coltrane), Tiesto, Martin Garrix, The Royal Concept, Dev, Donovan, Eddie Brigati (The Rascals), Steven Van Zandt, Minnie Driver, Lizz Wright, Charlie Hunter, The Michael Louis Band, The Seventh Word, Kevin Goodman (Goods101), Dolce Vita Strings, Ana Schurmann, Ron “Bumblefoot” Thal, Rumba Flamenca, Musica Viva, Universal Records, Republic Records, Mtheory, The Cutting Room, Avedis Zildjian Company, ReachNJ.gov, Fluent Visual, Blueliner, The Cy Walter Foundation. For Rubin Nizri at New Record Studios, being able to work with and record some of the brightest up-and-coming artists in New York City is just as satisfying as working with and recording the best. Whether it’s Lady Gaga or the next Sheryl Crow, the owner and chief engineer of New Record Studios takes his inspiration from sound – good sound. “When something sounds good, it’s effortless,” believes Rubin, who founded New record Studios in 1999. For the first thirteen years, it was located in a church on the Upper East Side of New York City. Looking to grow, Rubin began searching for a new location. After two years, he found a spot that embodies the vibrancy and promise of the artists he works with – the Powerhouse Arts District of downtown Jersey City. “Jersey City is a stone’s throw away from Manhattan and it’s become a growing artist community that keeps growing every day,” he says. Four months of intense labour and hard-earned sweat later, Rubin built the recording studios from the ground up, into its new home in Jersey City. 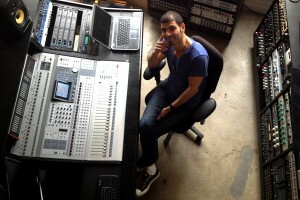 To each session, Rubin brings his experience as a sound engineer, producer and professional drummer, having played with many local New York City bands. He is a live recording engineer at The Cutting Room NYC, a venue where he worked as a sound engineer too. Rubin also designed the sound system and acoustics in their new location on 32nd Street. How To Program a Beat Or a Song. Audio Engineer, Musician, Artist… To take or not to take the job.